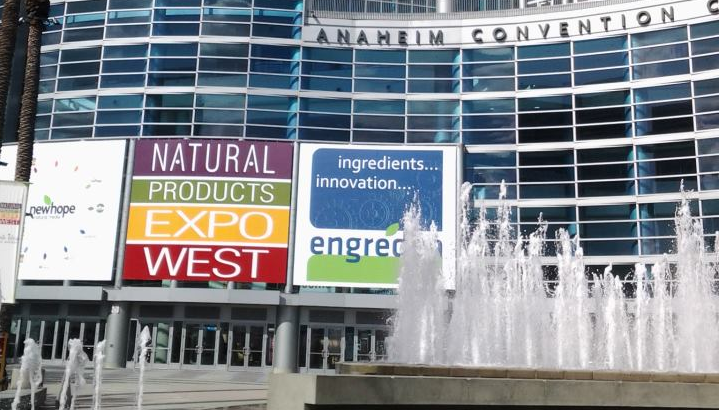 Yesterday I posted about sprouted grains being a big theme among exhibitors at the Natural Products Expo West. Another food found all over the Expo was coconut products. Coconut was once vilified, but as people are learning the truth about saturated fat, they’re now embracing coconut as the super food that it is. Among many of its health benefits, coconut contributes to growth and proper functioning of the brain. Coconut can also be used to make a plethora of different foods: oils, sweeteners, flour, desserts, and many more. A number of companies utilizing coconuts for different purposes had booths at the Expo West. Nutiva has a great lines of super foods, including coconut and palm oils. Tropical oils were demonized for a long time, making us believe that genetically modified vegetable oils were healthy. Even if vegetables are organic and non-GMO, their properties still change greatly under high heat, becoming rancid and having bad omega-3/omega-6 ratios. Coconut and palm oil, on the other hand, remain stable when heated. Palm oil was further vilified due to the destruction of rain forests that’s occurred to produce some products. What was always ignored was that there’s fair trade palm oil. The jar of red palm oil that Nutiva founder and CEO John Rulac is holding up in the photo above is sourced from small organic family farms in Ecuador. These farms aren’t part of the deforestation and habitat destruction which is taking place to produce palm in Indonesia and Malaysia. 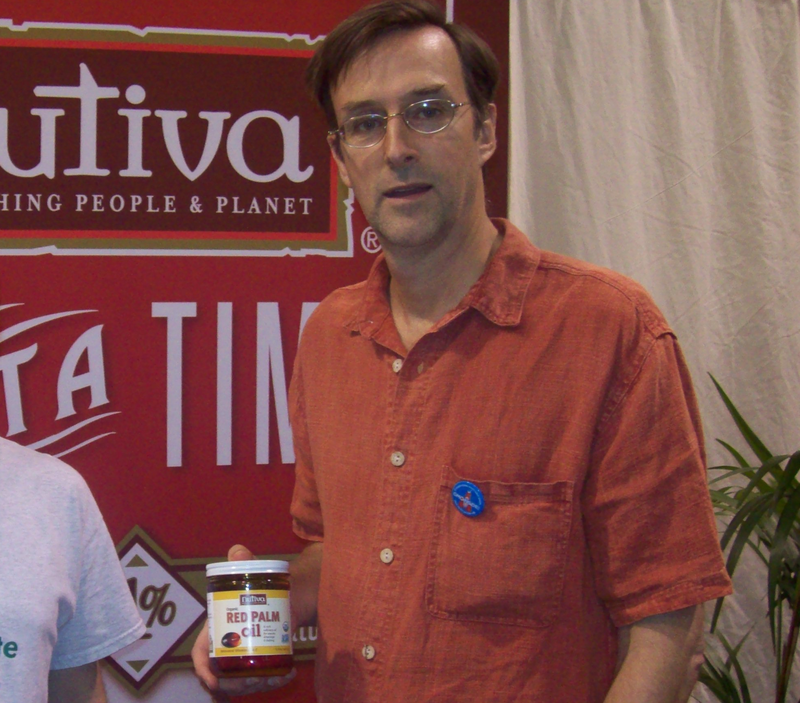 I was very pleased to hear about Nutiva’s efforts to promote fair trade and sustainable agriculture. Additionally, it’s great that they’ll start offering a palm oil in supermarkets. Currently, I can’t find any palm oil sold in stores in Los Angeles. 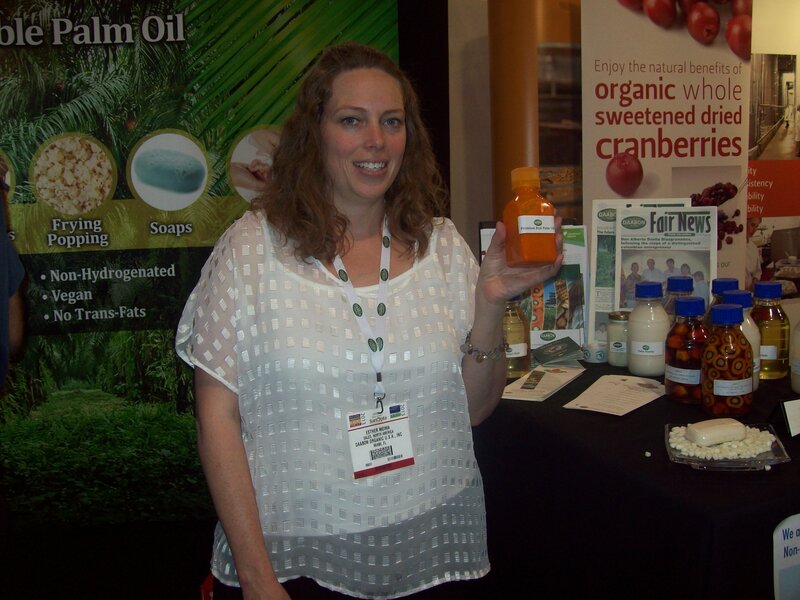 Another company that’s offering palm oil is Daabon Organics. Daabon’s booth did a wonderful job of explaining the many uses of palm oil from cooking and baking to making soap. In addition to coconut being used for oils, flower buds can be cut from the coconut palm to make sugar. This is a great alternative to any of the refined sugars, including cane sugar. It even has a lower glycemic index than dehydrated cane sugars like sucanat. 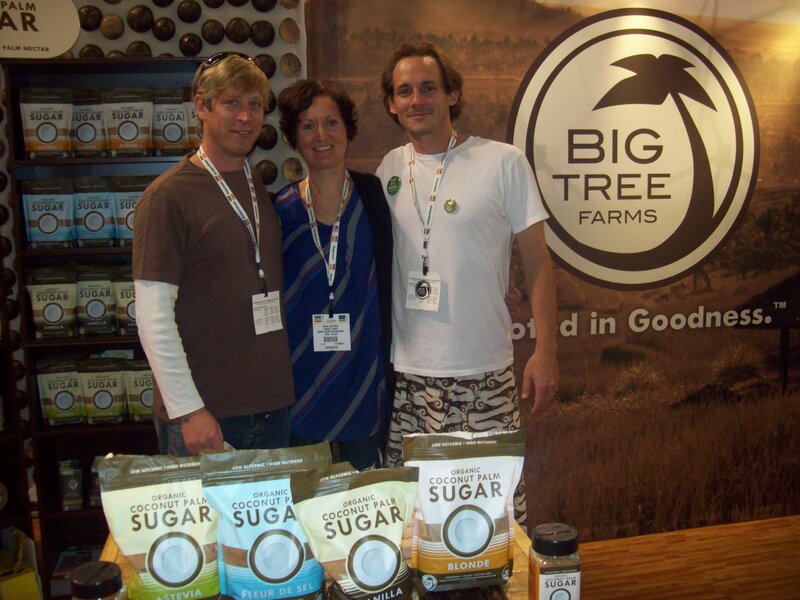 The founders of Big Tree Farms stand in front of the different flavors of their coconuts sugars. Big Tree Farms also produces several varieties of coconut palm nectar. 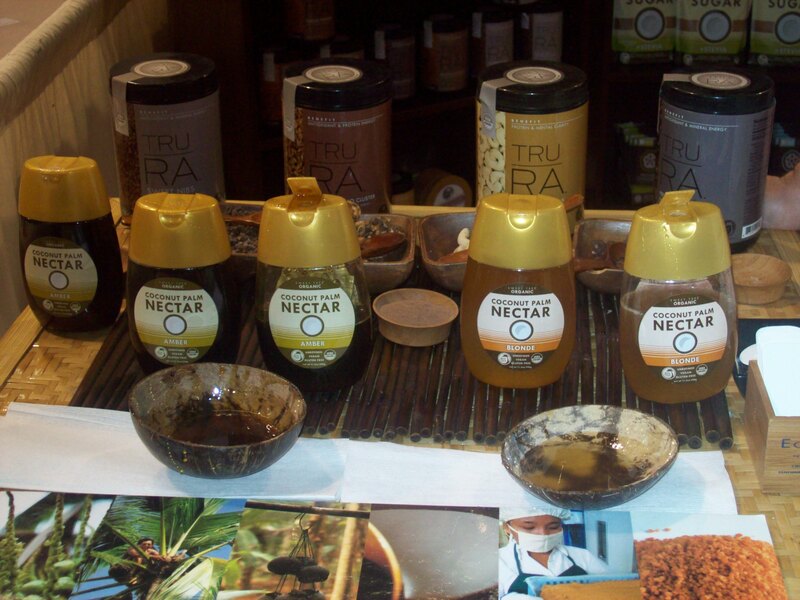 The nectar is similar to a maple syrup and a much better alternative than agave nectar or high fructose corn syrup. 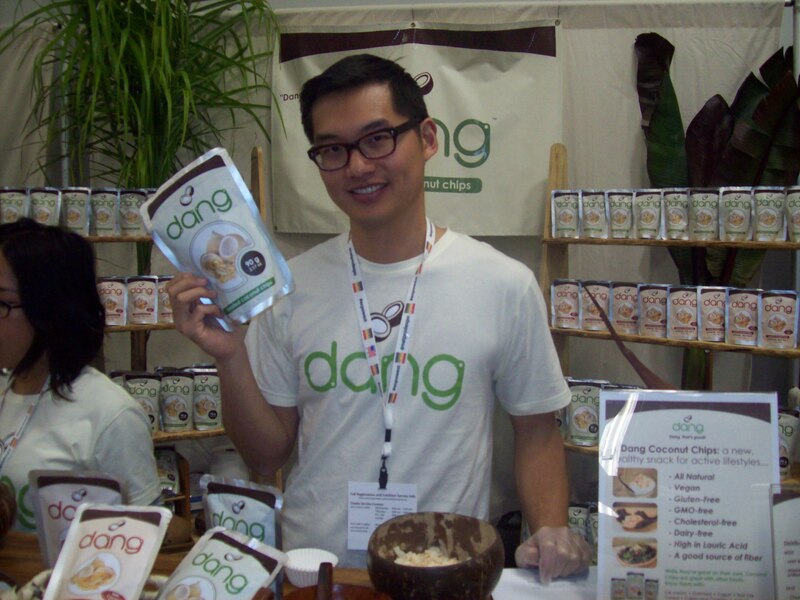 Dang Foods founder and chief culinary officer Vincent Kitirattragarn holds up a bag of his coconuts chips. This was a sweet and tasty snack, further demonstrating the great versatility of the coconut.